The Charleston Parks Conservancy (website) was created in 2007, fulfilling the vision of South Carolina philanthropist Darla Moore’s desire to “connect people to their green spaces.” IfYouWereMayor.com sat down recently with Harry Lesesne, Executive Director of the Conservancy to talk about the organization, how it works, how it relates to the City of Charleston’s Parks Department, and the importance of parks in cities. Harry, can you tell us a bit more about the Charleston Parks Conservancy and its mission? Our mission is simple and direct. We work to increase the quality, awareness, appreciation, and usage of Charleston’s parks and green spaces. Our work includes renovations, a portion of park maintenance, and programming, such our annual Teddy Bear Picnic and community gardens. At the core we want to help stakeholders and residents keep their neighborhood parks in good shape. To that end you can initiate a project yourself or with your neighborhood. We also take on projects at the request of the City of Charleston. As a little background, our work began as a partnership with the City of Charleston when public resources are stretched. The model for our organization is the Central Park Conservancy in New York City. It was established in 1980 at a time when New York’s resources were literally at a breaking point and Central Park suffered from decline, neglect, and represented public fear. The Central Park Conservancy incrementally built trust, and solidified its reputation and capabilities through a series of renovations, restorations, and programming. The Charleston Parks Conservancy similarly began with simple strategies. Some of our earliest efforts were developing a new park signage system, and collaborating with the City, the Charleston Horticulture Society, and the Windermere Community to develop the Windermere Boulevard Community Garden. At the same time, we began work on a conceptual master plan for the renovation of Charleston’s landmark Colonial Lake, working closely with the City of Charleston and the surrounding neighborhoods and community. The Colonial Lake renovation is our largest effort to date. We broke ground earlier this year and I’m sure everyone is looking forward to its re-opening early in 2016. We are excited about the renovations coming up at Hampton Park which were announced earlier this week. (See the Parks Conservancy Hampton Park page here). The work includes renovations to the former police stables and superintendent’s cottage as community facilities, and the re-opening of the Hampton Park café. We also plan improvements to the entrance of the park from Rutledge Avenue, and shifting the current playground away from the intersection of the park’s roads. We are also very excited about a new collaboration. We are working closely with the local arts organization Redux Contemporary Art Center (here) to launch a series of temporary site specific installations in public parks in 2016. Stacy Huggins, the organization’s executive director, is very excited about the possibilities for art that, by virtue of being outdoors, has “no barriers to entry.” Look for more details on this in the coming months. My dream project would probably focus on providing even more public access to Charleston’s waterfront. Both the new Northridge Park and the Higgins Pier at the end of the West Ashley Bikeway are excellent waterfront opportunities for West Ashley residents. Renovation of Brittlebank Park to include paddling opportunities would be fantastic. 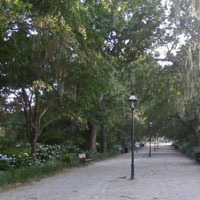 In my ideal world, the city of Charleston would be connected by its public green spaces and parks. Thank you so much, Harry. We look forward to seeing Charleston’s park life come alive in the coming years through the efforts of many led by the Charleston Parks Conservancy!